Over oiled Merbau deck. Note the sheen which should not occur if Aussie Clear is correctly applied. 1. Merbau is a very resinous timber. If the timber is new then when you apply any decking oil product, those resins will mean you won’t get as much of the oil into the timber. It is preferable to allow it to weather for 6-8 weeks, or wash it regularly with fresh water if under cover for about the same period. It’s the water that bleeds the resins out of the timber. In other words, timber finishes work best when you allow the timber to weather. When you do this, your first application of Aussie Clear will be a proper “dose” and should last between 9-12 months (depending on exposure). However, there is one exception to this where Preschem would recommend oiling the timber straight away, and that’s if the deck has been completed in the middle of a heat wave. In this instance, put one very light coating of Aussie Clear down immediately, as this will prevent the timber rapidly drying which can cause dimensional instability resulting in cupping, splitting and checking. However, this light application will not last all that long for the reasons explained above, so you will need to reapply sooner than what would normally be expected. Over oiled Merbau decking. Note the film is wearing off quickly. 2. Aussie Clear that hasn’t soaked in after 2 hours will form a semi-gloss film. When applied correctly to a timber deck using a lambswool applicator, Aussie Clear decking oil will not form a film. If there is an excess on the timber, then that oil forms a film on the timber if it’s not removed with a clean dry rag. This film actually looks quite pleasing, so the common mistake is to keep re-applying the oil until its a “nice” looking finish. This film can occur with any timber, but is more likely to occur with new Merbau due to it’s high resin content. The problem with this is that the film is not durable. It’s very easy to scratch and scuff the surface, which is a common complaint when this occurs. This is especially true on a hot day, as the coating softens significantly with heat. 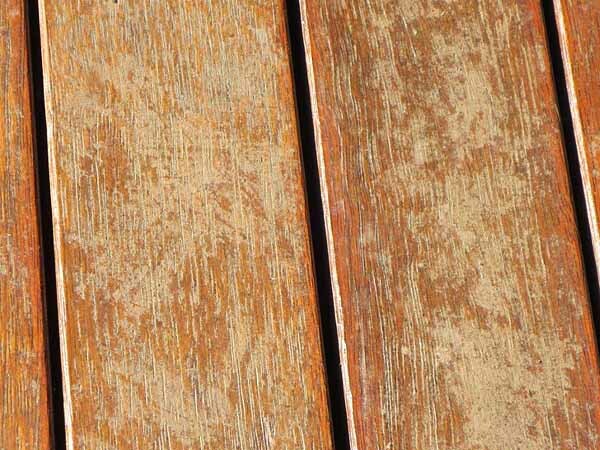 I was unsure what exactly I’d need to do to apply decking oil to merbau timber but this post has given me confidence in what I would need to do. I’ll have to keep in mind that a 6-8 week weather period for the wood is preferable. I’ll need to take care to avoid a film forming on the wood, like you warned. Thanks for the helpful info. I am a builder and have been reading all the data sheets from companys and the forums etc. Your explanation is by far the clearest. i have recently had a Merbau decking build around pool, like to match same color as fence. Can i paint on my new Merbau decking, when would be good time to paint and how many years would last after painted? Hi Jenny. Thank you for your question. Firstly, Aussie Clear is not a paint but rather a penetrative oil. Unlike a paint, it will leave the timber looking and feeling like timber. A paint is a solid colour coating. In terms of your pool, this will be a more maintenance intensive situation than other decks, especially if the pool is used a lot. The chlorine in the treatments (either sea salt or hypercholorites) will break down the Aussie Clear more rapidly, as it is very aggressive to any penetrative oil finish or paint system. So if you follow the advice here and in other news articles on the Aussie Clear in our website, I would estimate that you would get about 6-9 months per application. And if the pool is heavily used, it could be soon as 4-5 months. So it’s hard to say. I hope this is clear at this point. What do you do if you’ve already applied the stain oil on construction? thank you for your question. So you have already applied Aussie Clear to the decking? Has it been over oiled and has left a film as mentioned in the article and formed a film? Hi same problem for us. The decking man has oiled without letting any season time (same day as laying). mostly fine but has formed some patches where moisture has come up and/or settled and now it looks like dried puddles of pee in patches – you know, like watermarks on paper – help! Hi NS, thank you for your question in relation to this common problem. I think you are experiencing “extractive bleed” where the moisture from the rain or a hose etc is drawing it to the surface under the Aussie Clear. I hope this makes sense. 1. 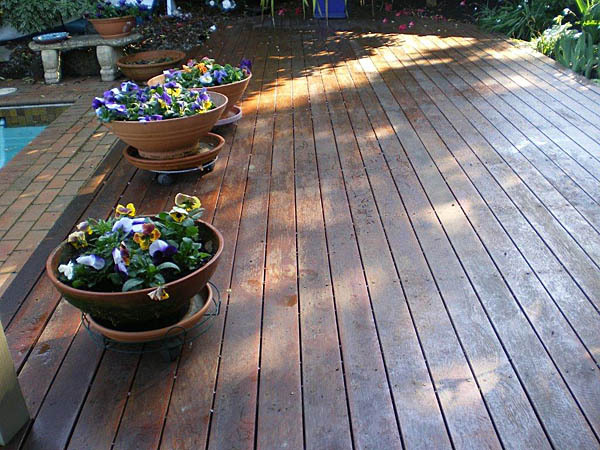 Leave it be and then when it’s time to reapply in 9-12 months time, do a careful preparation job on the timber using Preschem’s Grey Deck Cleaner. Note though that you may find the deck looks like it needs re-oiling sooner than this. Ignore that and ride it out for 3-4 months. If it’s Merbau or a drable Australian native timber like Iron Bark, Spotted Gum etc, don’t worry, it’s highly durable and will be fine. It just may go a little grey. The oxalic acid in the Grey Deck Cleaner will clear that up nicely. Then re-oil as per directions on the label. 2. If you’re wanting the perfect finish, then you have to sand it back and allow it to weather. Personally, this is overkill and a lot of hard work for not much gain. It’s not a train wreck so if it were me I’d go with option 1. Enjoy your deck. It should last you for years to come. Thank you for you’re enquiry. As we are in or fast approaching the business end of summer, then I recommend that you apply one coat only of Aussie Clear now to stabilise the timber. This will minimise the moisture loss on the sun exposed surface, which will reduce (but not entirely stop) dimensional stability issues like cupping, splitting, checking. But as the resins of “extractives” haven’t really had a chance to bleed out, this means that the timber won’t hold as much of the Aussie Clear as it would if it’s had 6-8 weeks of weathering. You may get 5-6 months life only. And if you’re likely to get rain within 24-48 hours of application, then postpone oiling until the weather picks up. This can cause other issues. I have some articles here that discuss this and in particular the issues with Merbau, which is a difficult timber to deal with when new. As I am not close to an Aussie Clear stockist, following a good sanding and wash down, will Cabots Danish oil cover my Jarrah outdoor table and chairssatisfactorily instead? Your advice will be appreciated. I recommend that you contact Cabots to get technical information on their products. I do not know the details of their product formulations or the suitability for this situation. If this furniture is an outdoor setting that’s partially or fully exposed to the weather, then be sure to mention that as this is an important condition when choosing a finish. fantastic, informative site – clear advice with sound reasoning.